The data files for the MN Walk In Access have been released by the DNR. I used the data files to pull up the WIA's in Google Earth and it made it very easy to zoom into the different areas and see what the hunting units look like. A severe winter followed by a wet spring contributed to a significant decline in Minnesota’s pheasant counts. According to the Minnesota Department of Natural Resources (DNR), the pheasant population index / count declined 64 percent from 2010 and is 71 percent below the 10-year average. A second consecutive severe winter, resulting in hen counts 72 percent below the 10-year average. Cold, wet weather during the April through June nesting period, resulting in brood counts 75 percent below the 10-year average. Loss of nearly 120,000 acres of grass habitat enrolled in farm programs such as the Conservation Reserve Program (CRP) since 2007. Severe winters combined with cold, wet springs are doubly hard on pheasant populations. That’s because fewer hens survive the winter and those that do are less successful in producing broods. Pheasant hunters are expected to harvest about 250,000 roosters this fall, the lowest harvest since 1997. This compares to harvests that have exceeded 500,000 roosters five of the past eight years. The 500,000 bird harvests correspond with a string of mild winters and high CRP enrollment. “We expect hunters to harvest a similar number of birds in 2011 as they did in 2001, which was another year with a severe winter followed by a cold, wet spring” said Kurt Haroldson, a wildlife biologist for the DNR’s Farmland Wildlife Population and Research Group in Madelia. Haroldson noted survey results indicated an unusually low ratio of hens to roosters. This suggests hen mortality was high or hens were nesting or caring for young broods during the survey. If the late nesting effort was greater than normal, the 2011 pheasant population and the fall harvest may be higher than forecast. Pheasant populations can rebound quickly given good habitat, mild winter weather and favorable spring nesting conditions. Minnesota is not the only state to see pheasant index declines. Wildlife officials in South Dakota reported a 46 percent population index decline. North Dakota’s spring population survey showed a decline, too. The highest pheasant counts were in the east central region, where observers reported 51 birds per 100 miles of survey driven. Hunters will find fair harvest opportunities in pockets of south central and southwest Minnesota, but harvest opportunities in most of Minnesota’s pheasant range are rated poor to very poor. This year’s statewide pheasant index was 23 birds per 100 miles driven, the lowest index since 1986. The pheasant index in southwest Minnesota, typically the state’s best pheasant range, fell 82 percent from last year to 19 birds per 100 miles driven. Haroldson said the most important habitat for pheasants is grassland that remains undisturbed during the nesting season. 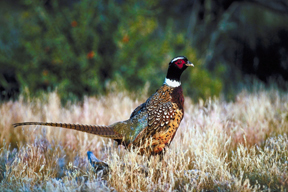 Protected grasslands account for about six percent of the state’s pheasant range. Farmland retirement programs such as CRP, Conservation Reserve Enhancement Program, Reinvest in Minnesota and Wetlands Reserve Program make up the largest portion of protected grasslands in the state. High land rental rates and competing uses for farmland diminish the economic attractiveness of farmland conservation programs. 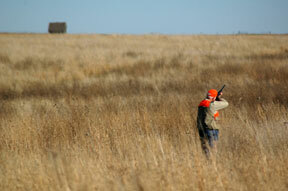 During the next three years, contracts for 550,000 acres of CRP lands are scheduled to expire. If not re-enrolled, this would reduce CRP acres in Minnesota by 36 percent. To help offset continued habitat losses caused by reductions in conservation set-aside acreage, DNR has accelerated acquisition of Wildlife Management Areas in the farmland region of Minnesota. DNR also supports habitat conservation on private lands by working with a variety of partners in the Farm Bill Assistance Partnership and Working Lands Initiative. Also, nearly 10,000 acres of private property will be open to public hunting through the state’s new Walk-In Access program. The 2011 August Roadside Report and pheasant hunting prospects map is available online. The full map set of all the Walk-In areas for MN is now available online. The maps show all of the properties available in the Walk-In program. There are over 9400 acres enrolled for 2011. PIERRE, S.D. - Pheasant brood counts indicate that pheasant numbers in South Dakota have returned to levels below the remarkable high counts of the past few years. However, the pheasant population in the main part of the state's pheasant range will still provide quality hunting opportunities. From 2003 through 2010, the statewide pheasant-per-mile index was at levels not seen in the previous 40 years. The index this year is 46 percent lower than the 2010 index and 41 percent lower than the average of the past 10 years. "We observed abnormally high mortality of hen pheasants during the brutal winter of 2010-11," explained Jeff Vonk, Secretary of the South Dakota Game, Fish and Parks Department, "The loss of that reproductive potential inhibited the ability of our pheasant population to rebound to the record levels that we have enjoyed in recent years." Declines in the counts were consistent across the state and most pronounced in eastern South Dakota, where winter's grip was tightest and grassland nesting habitat is diminished. "We knew this day was coming when important pheasant habitats provided by the cover in Conservation Reserve Program fields were lost," Vonk said. CRP enrollments in the state are currently at 1.17 million acres, down from 1.56 million acres in 2007. The reduction equates to over 600 square miles of grassland habitat. "On the other hand, we were pleasantly surprised how well pheasants responded in central South Dakota, where abundant moisture from winter snow and spring rain allowed grasslands to flourish and provide the essential habitat for excellent pheasant production," Vonk said. The counts in the main pheasant range are similar to or higher than the counts in 2002 when hunters bagged 1.2 million pheasants. Pheasant hunters harvested 1.8 million pheasants in 2010. "All things considered, pheasant numbers in much of the traditional pheasant range of the state are still good despite the declines in the counts," Vonk said. "Much of South Dakota will continue to provide a premier opportunity to hunt pheasants." NOTE: Comparisons are valid only between years within each local area.